FOTY 2015 Top & Back Complete! That big project I mentioned yesterday? I finished the Fabric of the Year 2015 top, back and binding over the weekend. The first thing I did Saturday morning (after tidying up, writing in my journal, drinking tea, starting the laundry, walking and making breakfast for the family) was get down to business with FOTY 2015. That thing has been on my wall long enough and I wanted to move on. I finished the top on Thursday or Friday. I basked in that excitement until Saturday before moving on to the back. After the massive ironing session I did on Friday, I had some nice pieces I wanted to use. I decided to make the back with fabrics that I really liked. I went back and forth about borders. Borders finish the look of the piece and stabilize it, but this quilt wants a binding, but no border, so I stay stitched the edge and will have to hope for the best in terms of squareness. 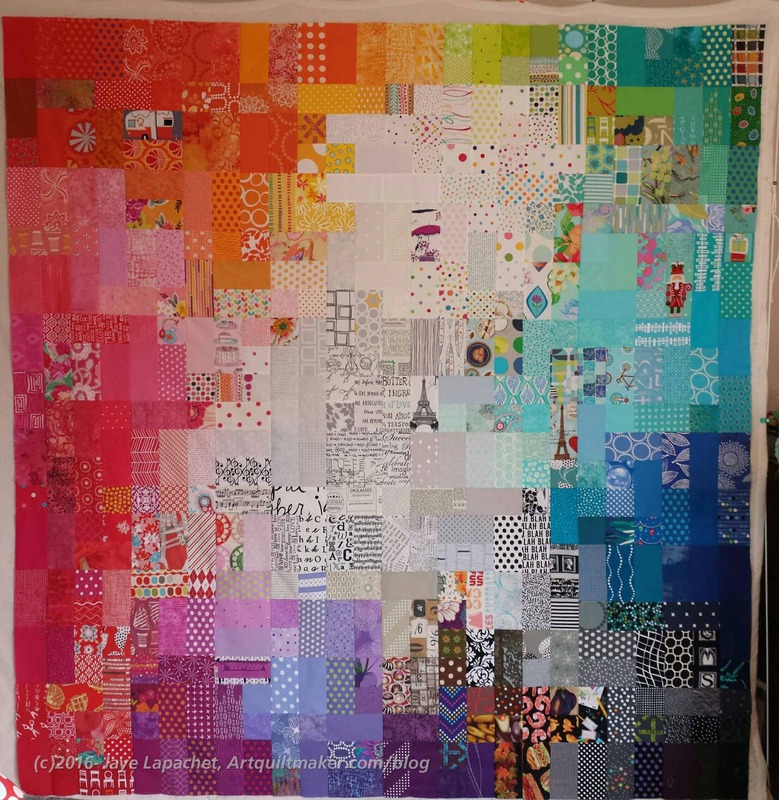 At the moment it is mostly square, but quilting is the wildcard. 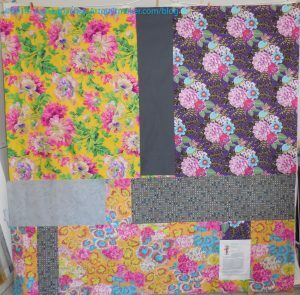 Speaking of quilting, I also had it in my head to quilt it myself. I really want some straight line quilting. 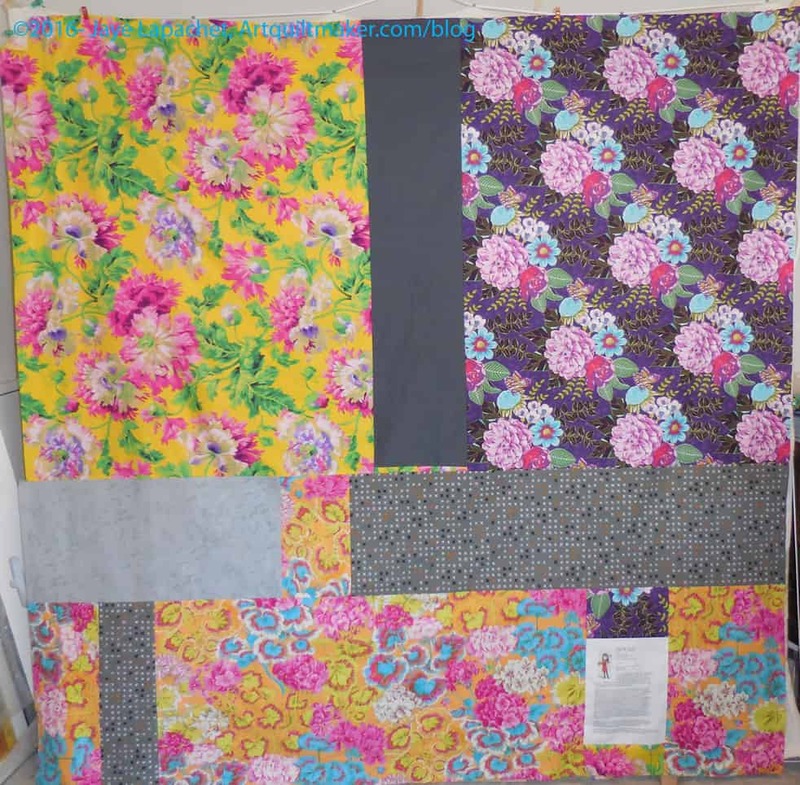 After convincing myself that quilting it myself would be a good idea, I backtracked. I’ll take it to Colleen. 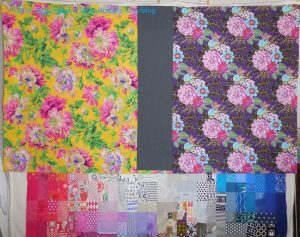 I have 3 other projects to quilt. Adding another is not a good idea. So, once those tasks and mind games were over, I made the back. Pressing fabrics the night before was a good idea. I found two pieces that I would love as dresses. I don’t have enough so I decided to make a back with fabrics I love. As you can see, lots of Philip Jacobs, though that purple is by someone else (Patty Slottinger???). I tried to find more of it, but no luck so far. It was a cursory search. I added in the greys just to give the florals space to breathe. I started to sew to avoid the label for a little while, but after making half the back, I had to deal with the label. That meant testing the printer. Cyan was out (I know gremlins print while I am not home and use up all my ink), so that meant locating some print cartridges and finding the cyan. I had one cyan left (WHEW!). Once the printer chores were complete, I created the label, printed it on paper and then copied on to fabric. I think labels are vitally important, but making them and sewing them in is a chore. This time the bottom half of the back went very well. Actually the whole back went very well. There was only one spot where I had to insert a small piece. All the other pieces were fairly large, which made process of the back go relatively quickly. I made the binding on Monday and now the whole package is ready to go to the quilter. 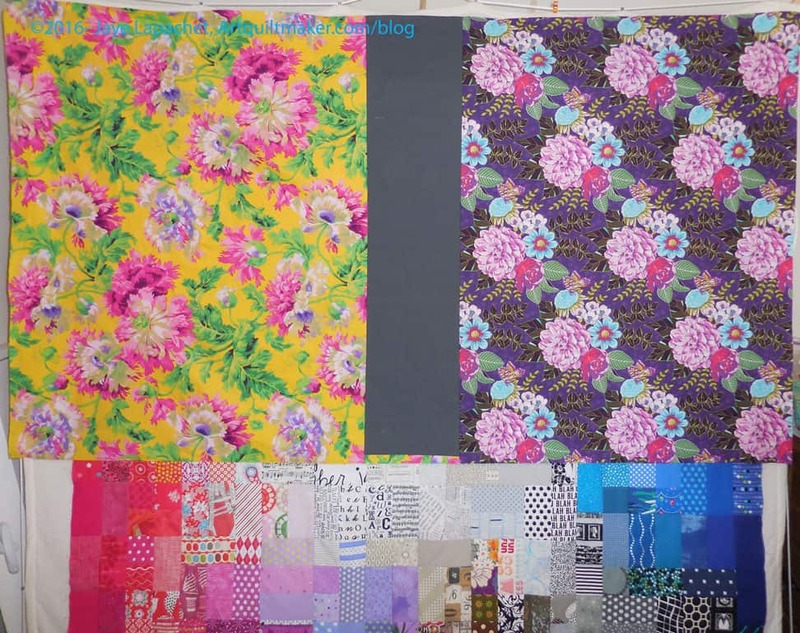 Author JayePosted on Thursday, June 2, 2016 Monday, May 30, 2016 Categories 2016Tags Fabric, Fabric of the Year, Fabric of the Year 2015, FOTY, Piecing, Process11 Comments on FOTY 2015 Top & Back Complete!